The animated Quebec film Racetime is the third in a series of films going back 35 years to the live-action drama, The Dog Who Stopped the War (the French translation is The War of the Tuques), part of the Tales for All series from producer Rock Demers. The top-grossing Canadian film of 1984 chronicled an out-of-control snowball fight among children in a Quebec town during winter vacation that led to canine tragedy. The story was remade as a 2015 animated film Snowtime!, which also topped the Quebec box office. The "tuques" phenomenon has extended to books, toys, and a "mini-tuques" spinoff television series. Racetime is a lively if somewhat bewilderingly busy story with a lot of characters who spend their time in an abandoned barn without any hint of adult supervision. The animation, too, is lively if generic and features characters with stubby bodies, pipe-stem legs and spikey hair plus lots of white snowscapes. At the centre of the story is egocentric boy genius, Frankie Four-Eyes (the French name, Francois Les Lunettes, doesn’t sound like an insult) who has one square and one round glasses lens. He creates elaborate sled designs in his lab in the barn's basement, to be driven by Sophie, who he’s sweet on. The plot concerns the arrival of a challenger, the sneering Zac, who twirls a candy-cane in his mouth like a cigarette holder and seems to have an unlimited budget for gadgets. Zac has a cousin, a svelte girl driver and aspiring singer, Charly, whose flirty presence turns Frankie's big shy mechanic friend into a distracted mess. That makes it easy for Zac to mess with Frankie's sled-building plans. 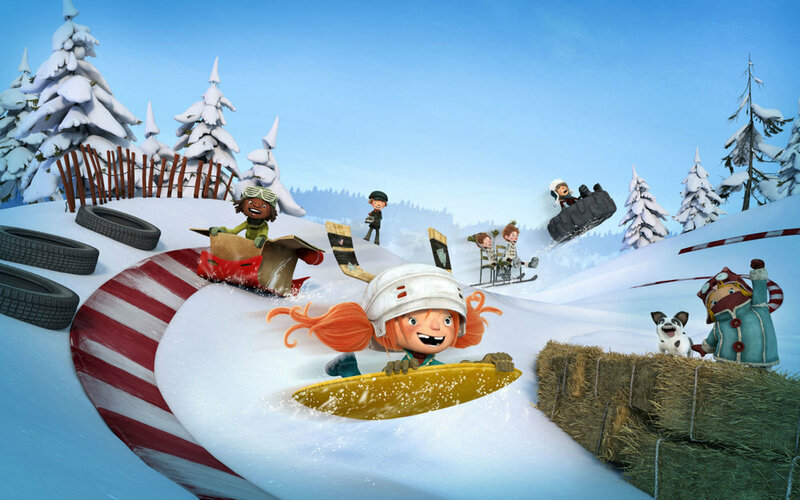 During their first race, Frankie's elaborate sled mysteriously collapses just before the finish line. This leads to a little bit of Spy Kids investigation, leading to a rematch. There’s more racing and a lot of pop songs (Cyndi Lauper, Simple Plan) and it all concludes with some life lessons about why sharing is more important than winning, though winning's pretty great, too. There is, I should mention, a slobbering puppy in the film, which might be cause for concern for anyone familiar with the two previous films. But have no fear. Racetime takes dangerous narrative curves which is understandable. War is tragic; sled racing is probably something you shouldn't get too worked up about. Racetime. Directed Benoît Godbout (co-directed by François Brisson, with consulting director Jean-François Pouliot). Written by Claude Landry, Maxime Landry and Paul Risacher. Featuring the voices of Lucinda Davis, Noel Fisher, Angela Galuppo, Dawn Ford, Todd Fennell, Don Shepherd. Opens in limited release January 25 including Toronto’s Cineplex Yonge-Dundas and Eglinton Town Centre.